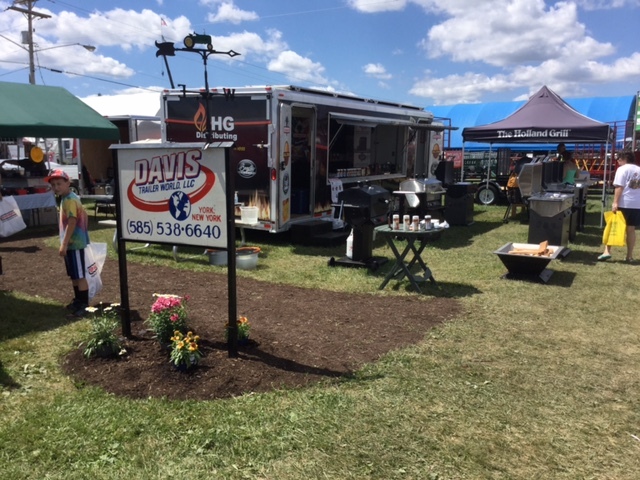 The 2015 Empire Farm Days Show marked the 25th year of our participation. Of those 25 years, this year was by far the best 3 days of weather, not too hot and not too rainy or muddy. Empire Farm Days Show at Rodman Lot Farms in Seneca Falls, NY was on August 11, 12, and 13th 2015. The interest in our products was in greater demand than the past and the event had record attendance on the final day. Our 15,000 square foot lot (309) was filled with over 45 different trailers from our 4 main trailer companies; Featherlite, Corn Pro, Belmont and Aluma. For the first time this year, Mission Trailers were also added to the lineup. Mission offers a value combination horse trailer. Its popularity is proven due to selling 3 at this show. Speaking of sales, 75% of our total representation was sold at this year’s show. Our aesthetically pleasing lot with a diverse product line consisted of motorcycle snowmobile, open and enclosed car, horse, cattle, utility, flatbed, dump and cargo. All of these models were shown in both steel and aluminum construction. As always, our Aluma truck beds were a hit. This year we also expanded our Holland Grill display. A representative from HG Distributing joined us for Farm Show along with a huge demo trailer filled with goodies. We offered tasty samples off of the Holland Grill including salmon, chicken legs, meatloaf, pizza, sausage and biscuits, a whole turkey and more.